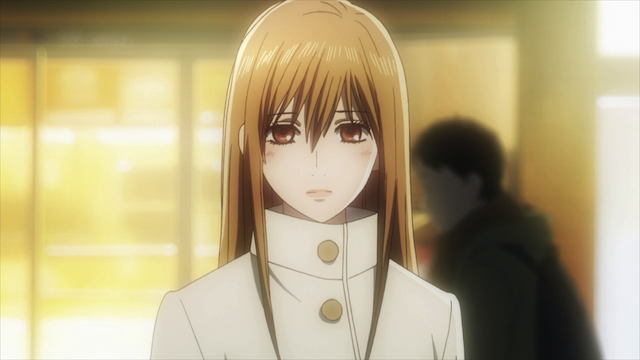 Chihaya Ayase ~ cuckoo for Karuta. Chihayafuru was a wonderful series, and the most consistent series I have ever watched. 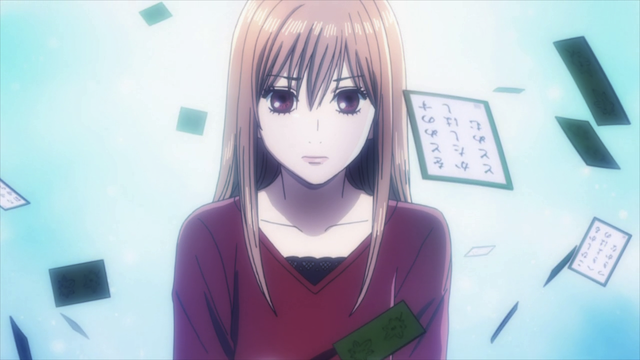 I have watched bad anime, and anime that has flashes of brilliance, but also falls a bit flat on occasion, but never have I seen a show like Chihayafuru, a show that was absolutely solid from start to finish. 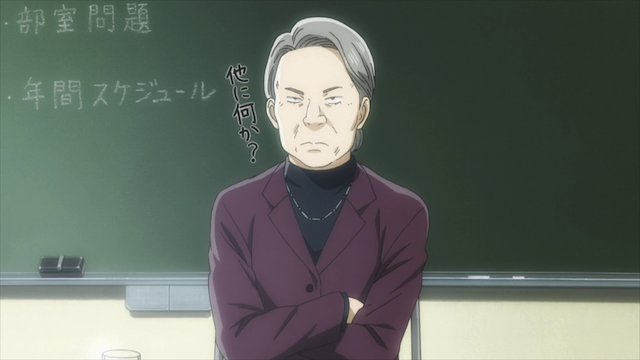 If you are wondering if Chihayafuru is worth watching, it is. It certainly is my favorite show of 2012 so far. If there is ever a second season, I will watch it. If you want a spoiler-free introduction to what this series is about, take a look at my first impressions post. For those who want a more in-depth discussion of this series, I have blogged every episode and even wrote about the first volume of the OST. The rest of this post is specific to episode 25 — the final episode! Don’t read it unless you want to see spoilers. 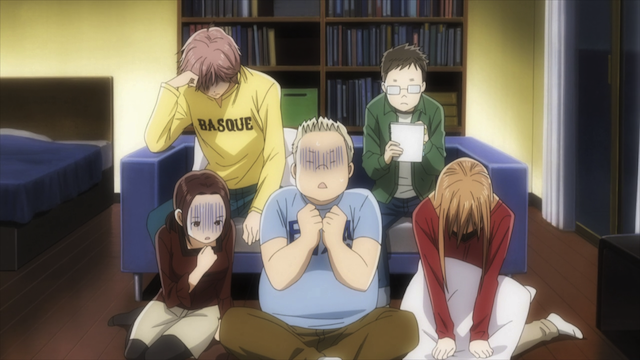 After watching the Meijin/Queen Matches, the Karuta club is feeling overwhelmed. While everyone else seems to have given up, Tsutomu Komano applies himself to the problem. Tsutomu's discovery has the power to change everything. On the way home, Tsutomu announces a shocking (and wonderful) surprise: Chihaya plays as if she has 20 one-syllable cards. The distance between her and the Meijin isn’t anywhere near as far as it had seemed just a moment ago. Suddenly the energy of the entire episode changes. 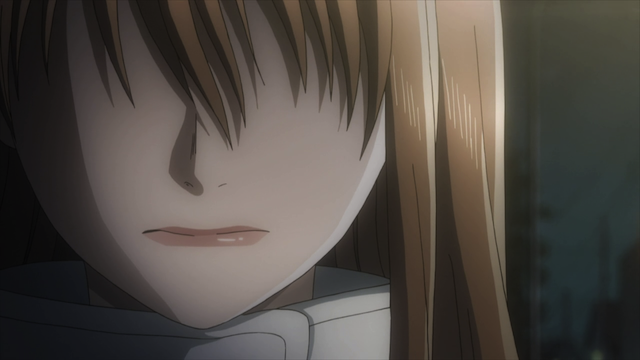 Chihaya is back on track towards her goal of becoming the Queen. Taichi Mashima has developed quite a drinking problem. Arata Wataya. Taichi manages to get this kind of reaction by calling Arata, but he can't get a rise out of Chihaya, no matter what he does. Taichi calls Arata, who has been feeling the pressure himself. Arata is serious about taking on the Meijin next year, but he knows he needs real physical matches against a strong opponent. Just as Arata is explaining his insight into the way the Meijin lays out his cards, the strongest player in Arata’s area shows up to play Karuta with him. Arata has the opponent he needs, but he also did something else: he inspired Taichi. Taichi Mashima. Practice swing workout on the tatami. This was one of my favorite scenes in the episode. Kanade is despairing that her own goal of becoming a certified reader is out of reach, since it requires becoming a grade-A player, something that has eluded Taichi, despite his obvious talents. Taichi, however, starts loudly slapping the tatami mat and vigorously taking practice swings, all while a new (and very high-energy) musical theme starts playing. Everyone knows that Taichi doesn’t practice his swings, so this is a clear sign of his new-found motivation to achieve the goals that have eluded him thus far. Taichi’s intensity cheers up Kanade, who remarks that, “nobody wants to give up their dream”. The Empress. Apparently she also goes by the name Miyauchi. Of course there is also a little conflict to keep us from thinking the road ahead will be easy. 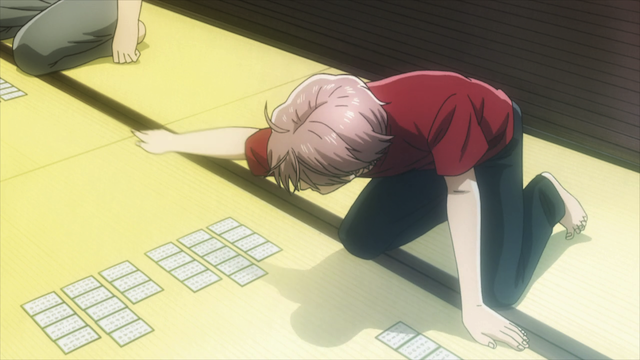 The Karuta club is put on notice that they need to double the number of members, or they will lose their club room. But even this bit of tension was a great way to develop the Empress even more. 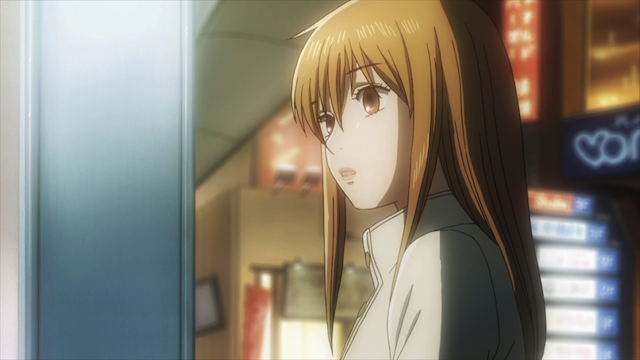 She has gone from a constant critic of Chihaya, to a true supporter. Arata Wataya. 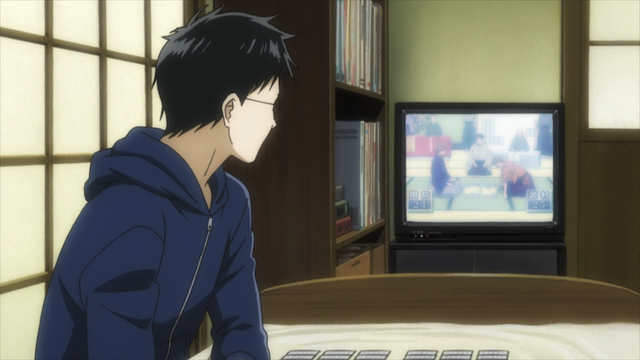 Karuta player watches Karuta players on TV while being watched by us. Whoah. Another flawless episode. It was difficult to imagine how this final episode could work, since everyone had been knocked out of the tournament long ago. It turned out to be a story not only about them watching the tournament, but facing their own inner doubts and realizing the power of their dreams is more forceful than their fear of failure. Each member of the original three faced a crisis and overcame it, as did Kanade. Meanwhile Tsutomu was the one that helped Chihaya overcome her demon (much as Taichi helped Tsutomu slay his “desk” demon when he was first introduced). It hasn’t been an easy ride for anybody, but they have all committed themselves anew to their chosen paths. And now comes the sad part. There is so much more that these characters can share with us. 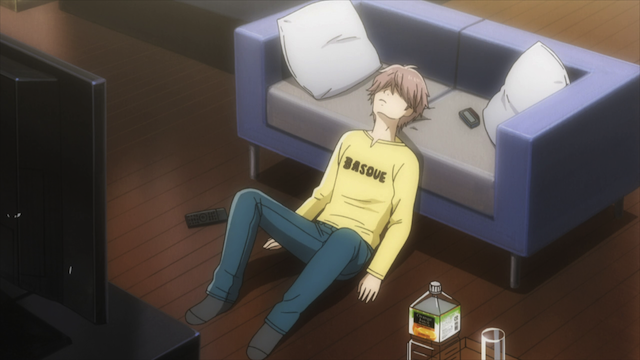 Chihayafuru was a remarkable series. It had flawless direction, great music, art, and acting. I don’t want it to end! And yet there is no second season season announcement. This is truly a shame. Hopefully one day soon we’ll all be celebrating, because a new season will have been announced. The inspiration, the energy, the pacing, the music, and the character development. 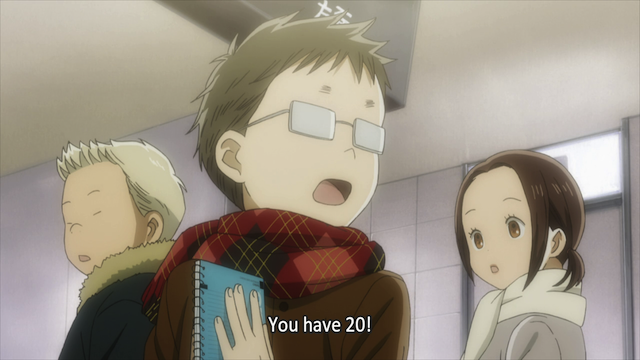 All of those made Chihayafuru the great show it is. 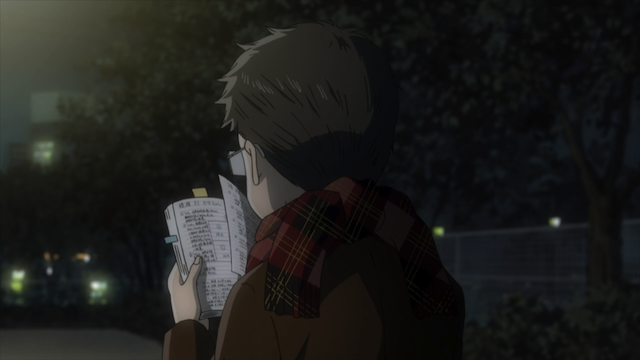 While the sports genre is typified by long matches that span 2+ episodes for dramatic effect, Chihayafuru goes through those at a fast clip while keeping us engaged all the way through. I’ve heard rumors of a second season, so let’s keep our fingers crossed that it pans out. I hope those rumors are true then. BTW, a second volume of the Chihayafuru OST is now out. I haven’t had a chance to listen to it yet, unfortunately. And I really really really hope that rumor of a second season isn’t just from wishful thinking. Considering how financially badly this show has done, if it does get a second season it’ll have to be purely because SOMEONE thinks it’s worth losing money on. And bless them, if they exist. I wonder if they are really losing money on it. I wouldn’t be surprised to find out that it isn’t making as much money as some other shows, but I think the anime industry has a tendency to equate “not making a lot” with “losing money”, and I just don’t see those as being the same things. As to the rumors, I haven’t seen any that look credible yet, but I’ll keep hoping. A nice ending, things weren’t concluded in anyway but what else could you expect from this show? A nice uplifting one with all the characters affirming their goals suits it better, it almost feels as if it’s only taking a short break and will be right back soon. At least I hope so, apparently the sales stunk but it managed to garner a good viewerbase. So there may be hope for a second season yet. As for the episode itself Suo’s playstyle was a bit of a surprise, I expected more similarities to Chihaya’s own and he turned out to be a sort of omnipresent overbearing sort of player. Secondly I also liked the growth we saw in Arata and Taichi, the former is pretty much back in his game and the latter has become dedicated to Karuta that one bit more, I just hope he didn’t have to burn Chihaya’s Daddy Bear collection. Heh, heh. I don’t think he would really burn them. Chihaya has him wrapped around her little finger. He might enjoy teasing her about it, but you know he could never carry through with hurting her precious Daddy Bears. “affirming their goals”: I like that way of putting it. Everyone seemed engaged at the end, and looking ahead to a new challenge. I really like the fact that they got into some details about Kanade’s goal. This was the first episode that they even provided the name for the Reader, and having that little moment during the Meijin match was really nice as a complement to Kanade’s struggle to improve her reading style. They did a surprisingly good job of keeping multiple balls in the air at one time. I came to appreciate all the main characters in different ways, and enjoyed seeing them make progress in their own way. It’s definitely a shame to have to let go, but maybe it will be back some day in a glorious second season. It sure looks like it with that bottle of whisky in front of him! 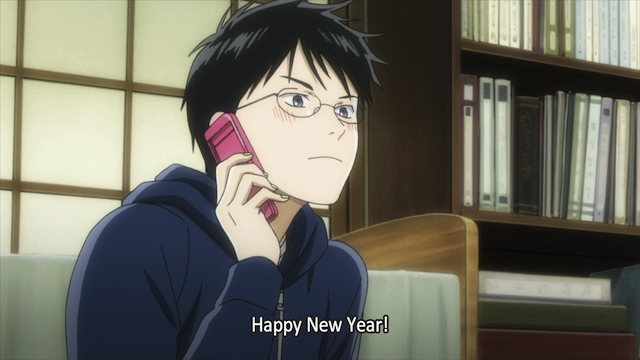 CHIHAYAFURU’S GETTING A SECOND SEASON! YAY! Yes. This is great news. I’m looking forward to seeing where the story goes from here.